Representative of the local miner's union in Espigao d'Oeste. Frontline/World Reporter Mariana van Zeller: What was the relationship between the Indians and the miners before the massacre? 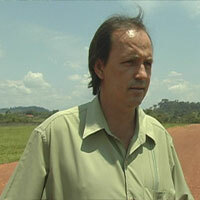 Celso Fantim: There are around 400 or 500 miners working with the Indians in the reserve today. The Indians take the miners close to the police checkpoints, then [the miners] walk through the jungle sneaking past the checkpoint, swimming across the Roosevelt River into the reserve, and they meet the Indians farther down the road. When the federal police decide to remove the miners, the FUNAI [National Indian Protection Agency] runs to warn them. So they hide in the jungle, and when the federal police arrive, there is no one there. Because the miners who come from the reserve tell us how it works. Do the miners work for the Indians? Are they paid a salary? They give [the miners] a commission, depending on how much the miner produces. The FUNAI should prohibit whats going on inside the reserve, but the FUNAI is collaborating with whats happening. The first principle behind the Kimberley Agreement is that diamonds that are given a Kimberley Certificate cannot be blood diamonds. And blood has been shed to mine these diamonds. They were illegally explored. The government knows this. If big mining companies wanted to, they could easily expel Brazil from the Kimberley Process because the Brazilian government is acting illegally. To mine diamonds you need a mining plan, a recuperation plan for the affected areas and an environmental control plan. Plus, you have to obtain a mining license from the DNPM [National Department for Mineral Production]. The Indians dont have any of this. They are mining whatever way they want to and are acting outside the law. What will happen if the mine is legalized? If they legalize the mine only for Indians, it wont work. The miners will probably invade. They feel they have a right to the mine as well. They were the ones who found it. If they legalize it for a mining company, for a multinational, then what happened in Angola will probably happen here -- a guerrilla war. The mine belongs to Brazilians. Were not going to work as servants here, knowing that we own a fortune, that everyone can provide a good life for their children, grandchildren, great-grandchildren. To have a company from outside come and take that? It wont happen.